Navigation through the maze of advice for the self-coached climber. 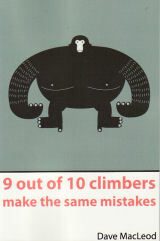 9 out of 10 climbers are stuck. They are stuck on the same things. Some of the things that hold climbers back from improving their climbing standard are the same as they were 20 years ago: motivation, managing time, and not being able to analyse and correct their own basic technical or tactical errors. But they are also stuck for a new set of reasons. Twenty years ago, the problem was that no one knew how to train for climbing. Information was scarce. Today, it's the opposite problem. Book after book lists technique, exercises and tips. Navigating this barrage of information, filtering out the irrelevent and homing in on what matters to your life, your climbing and your circumstances has been the limiting step for today's climber. This 176 page book is the first to present the science of improving at climbing in a way that will actually help you make confident decisions and stay focused on the things that will make the biggest difference.